A flurry of criticism also emerged surrounding recognition for the film by the Academy of Motion Picture Arts and Sciences, with accusers claiming that the film was overlooked. But Heschel dismissed the defense, saying that while some creative licence is acceptable, there is a limit to how far one can go. “If you made a film of the 1960s and showed black people enjoying segregation in the South, you can’t just say it’s a film and not a documentary,” she said. Heschel mentioned Dowd’s column, in which she describes how black youths were enthralled by the film at a viewing she had attended. “By not showing my father marching, it is depriving the viewers of that inspiration,” she told The Algemeiner on Sunday. 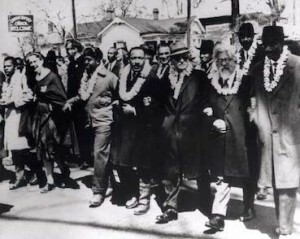 “My father felt that the prophetic tradition of Judaism had come alive at Selma,” Susannah Heschel wrote. ”He said that King told him it was the greatest day in his life, and my father said that he was reminded at Selma of walking with Hasidic rebbes in Europe. Such was the spiritual atmosphere of the day. Abraham Joshua Heschel, who died in 1972, was born in Poland and came to the US in 1940. He is considered by many to be among the leading Jewish theologians of the 20th century and is revered as an icon of liberal Jewish values. Segun tomado de, http://www.algemeiner.com/2015/01/18/fresh-controversy-hits-selma-daughter-of-rabbi-abraham-joshua-heschel-shocked-by-exclusion-of-her-father-from-film/ el lunes, 19 de enero de 2015. Next Post What is Messiah?